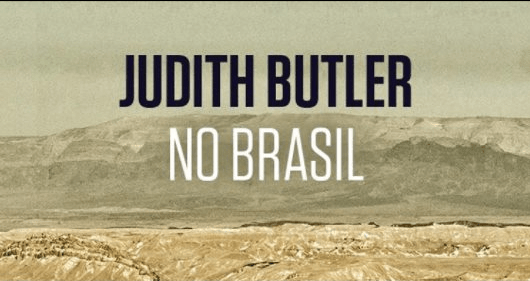 In the third week of October 2017, an array of openly right-wing formations comprised by the Catholic hierarchy, evangelical Christians, conservative psychologists and the Schools without Party movement initiated a petition (hosted at Citizen Go the Spanish based right wing web platform) to contest the visit of Judith Butler to Brazil. A poster against her presence was also circulated on social media by the Jewish right wing. The feminist philospoher was scheduled to be in São Paulo in the first week of November to attend the International Colloquium on the Ends of Democracy, an event counting with the participation of other renowned intellectuals including Butler’s partner Wendy Brown. A day before she would launch the translation of two of her books: Parting Ways: Jewishness and a critique of Zionism and Parting Ways: Jewishness and the Critique of Zionism — Caminhos Divergentes — judaicidade e crítica ao sionismo (Boitempo Editorial The Psychic Life of Power: Theories in Subjection — A vida psíquica do poder — teorias da sujeição (Autêntica). Subsequently, she would attend a close academic seminar in Rio de Janeiro. In few days, 370,000 signatures were collected to protest against her visit as a threat to “the natural order of gender, sexuality and the family” even when Butler would not speak on gender in any of these events. The responses in support to Butler´s visit were also quite immediate. The website of SESC, where the colloquium was to take place, received a barrage of positive evaluations. Six academic and civil society organizations have issued official statements of support. Local progressive groups from São Paulo planned to embrace the SESC building where the Colloquium would take place and measures were taken to ensure Butler´s safety. No problems were registered at the November 6th book launching in the premises of the Federal University of São Paulo. But the next day, meanwhile the Colloquium evolved, protesters and supporters assembled in the street. Jointly, the two demontrations — against and pro Butler — gathered around 200 people. The anti-Butler burned an effigy portrayin the philosopher as a witch, a gesture evoking the Portuguese colonial and inquisitorial practice of auto- da fé (act of faith) in which witches, Jews, heretics, protestants and “sodomites” were publicly executed in bonfires. The aggressions did not stop there, however. Few days later right wing group — screaming against pedophiles — assaulted Judith Butler and Wendy Brown in the São Paulo airport when they were boarding their flight to Rio. In targeting Butler, these forces aimed at feminisms, queer theory, LGBT rights but also the left more broadly speaking. The virulence and scale of the attack contrasted with the very small protest organized against the philosopher when she visited the country in 2015, bluntly illustrating how these forces have become exponentially aggressive in the course of the last two years. As insightfully noted by Isabela Oliveira in an article published by the web portal NEXO, this vicious assault against Butler must be situated in relation to dynamics leading towards the 2018 Brazilian presidential elections, to be more fully aprehended. In November, 2017, this electoral disputed was predicted by opinion polls to sharply oppose the figures ex- president Lula and ex- Army captain and extreme right candidate Jair Bolsonaro. Oliveira and her team observed the demonstrations and a did a survey with both protetesters and supporters of Butler. This on spot study informs that seventy percent of those supporting Butler defined themselves as belonging to left, while sixty percent of those protesting against her presence declared to be right wingers. Silva correctly observes, however, that this sharp left –rights rift is typical of organized groups and does not necessarily reflect broader societal ideological views that tend to be much more blurred. Readers from outside Brazil will be surprised to learn that two other effigies of persons considered despicable by right wingers were also burn on November 7th. One of them was George Soros, whose specter in the protest must be read as a strong symptom of connections between Brazilian conservatives and similar forces in the US, Eastern Europe and Israel (where the magnate is also under open attack). But, quite unexpectedly, a puppet representing the ex- president Fernando Henrique Cardoso was also put to the bonfire. His awkward inclusion in this scene may be explained by Cardoso´s connections with Open Society Foundation initiatives in relation to drug legalization, but most principally – as insightfully analyzed by Silva – can also be interpreted as a bait launched by right wingers to capture the adherence of those who historically opposed Cardoso and his political party.To summarize: the attack on Butler has revealed how deeply Brazilian politics is polarized today. It also demonstrates that conservatives are transnationallly connected and, most principally, that gender and sexual politics are now squarely placed in the eye of the storm of electoral dynamics. I understand that the puppet/poster representing me included both a witch’s hat and a bright pink bra, signifying gay or trans life in some way. I am not sure they thought about what it meant to accuse me of being both a witch and trans. If I am trans, then I would presumably be a man, but if I am a witch, I am presumably a woman. It seems they were engaged in a bit of gender trouble of their own. When violence and hatred become the instruments of religious morality and politics, then democracy is threatened by those who would tear apart the social fabric, punish difference, and undermine the social bonds required to support our co-existence here on earth. I will remember Brazil for all the generous and thoughtful people, whether secular or religious, who sought to block the blows and stop the hatred. They are the ones who seem to know that the “end” of democracy is to keep alive hope for a non-violent common life and commitment to equality and to freedom, where intolerance does not become simple tolerance, but is rather overcome by the courageous affirmation of our differences. Then we all begin to live and breathe and move with greater ease and joy -the ultimate goal of the courageous democratic struggle to which I am proud to belong: to become free, to be treated as an equal, and to live together without violence.